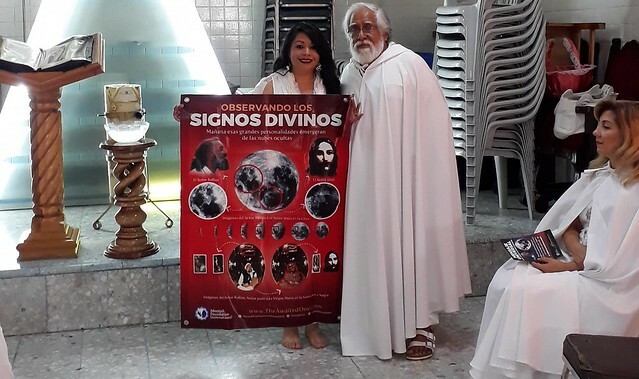 A team from Messiah Foundation International Mexico, led by Tatiana Arana, has been busy promoting the message of divine love and universal spirituality all across Mexico. Recently, they organise a programme alongside the Universal Great Brotherhood in Mexico City. At the gathering attended by Universal Great Brotherhood members and affiliates, our team spoke about the revolutionary teachings of His Divine Eminence Lord Ra Riaz Gohar Shahi and raised awareness of the divine signs, in particular, the miraculous images of His Divine Eminence Gohar Shahi and Lord Jesus Christ on the Moon. The response our team received has been fantastic and overwhelming, as many recipients of the message immediately felt drawn to His Divine Eminence Gohar Shahi’s message, teachings and unique personality. Our team looks forward to continuing their activities alongside the Universal Great Brotherhood as they take the message of divine love to all willing hearts in Mexico.